This delightful cheesecake is made up of 3 parts: a dark chocolate tiramisu crust, a coffee Amaretto flavored soft shell, and a creamy Amaretto filling. You may not be hungry now, but you want it anyways. Brandy or whiskey can be substituted for Amaretto liqueur. Prepare a 9.5 in pie pan with removable bottom by greasing it with butter. Break chocolate into cubes, melt, and cool to slightly warm. Dissolve coffee in hot liqueur Amaretto, then allow to cool. Beat soft butter and sugar with an electric mixer for about 5 minutes until fluffy. In another bowl, beat egg. Add butter and chocolate. Continue mixing. Add flour slowly while mixing until. Then add melted coffee. Mix until mixture becomes a doughy batter. Push batter into shape on the pie pan. Flatten its bottom as much as possible. Put into the oven and bake for 8 minutes to make the crust. Let cool after baking. In the bowl of a mixer stand, add cream cheese, mascarpone cheese and flour. beat for about 2 - 3 minutes on medium or low until smooth. Gradually add the sugar, all the while mixing at low speed mixer. Mix in eggs one at a time with an interval of 30 seconds. Then add in cream, vanilla extract and Amaretto liqueur. Pour the mixture on to the crust pan and bake for 15 minutes. Decrease the temperature to 250 degrees F and bake for another 90 minutes, until the filling sets. In a bowl, beat sour cream mixed with superfine sugar. Dissolve coffee in hot Amaretto liqueur. Set aside about 2 teaspoons of coffee / Amaretto mixture for pattern. Mix the rest with the cream. 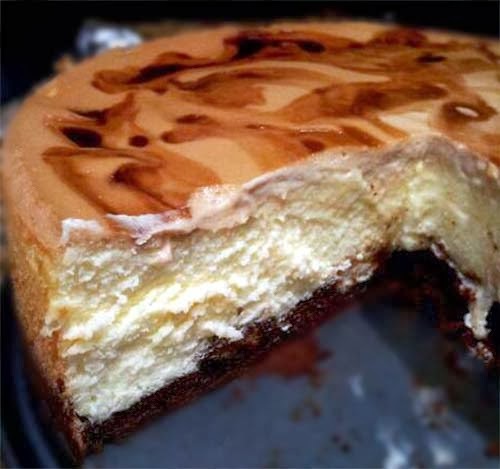 Spread the coffee/Amaretto cream on the cheesecake evenly. With the remaining unmixed coffee / Amaretto, draw patterns across the surface. Put cheesecake back in oven for another 15 minutes.